Facial recognition biometrics is experiencing a period of growth as cost curves and use cases converge to produce a variety of applications in consumer, enterprise, and government markets worldwide. Tractica predicts that annual facial recognition devices and licenses will increase from 28.5 million in 2015 to more than 122.8 million worldwide by 2024. During that period, annual revenue for facial biometrics – including both visible light facial recognition and infrared-based facial thermography – will increase from $149.5 million to $882.5 million, at a compound annual growth rate (CAGR) of 22%. The consulting firm says that adoption of facial recognition will be particularly strong during the next several years in mobile device authentication, but areas of growth will also include government applications such as national ID cards and biometrics passports, as well as finance/banking and retail applications. 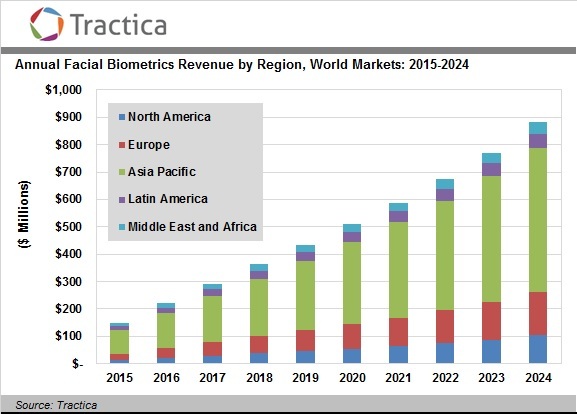 Tractica’s report, “Facial Recognition,” examines the market for facial recognition biometrics hardware and software, including 10-year forecasts for the period from 2015 through 2024. The report examines 20 use cases specific to face biometrics, forecasting revenue and software licenses for facial recognition, along with revenue and device shipments for facial thermography. The FIDO Alliance introduced additions to the FIDO 1.0 specifications with new transport protocols for FIDO U2F adding Bluetooth Low Energy and Near Field Communication. With these new transport specifications, FIDO U2F is appropriate for mobile and wireless applications, and devices that do not have a USB port. The U2F Bluetooth transport specification enables the creation of special-purpose, Bluetooth Smart U2F devices that require just the press of a button to authenticate to an online service. In addition, phones and peripherals, which consume more power, can be programmed to act as U2F devices using Bluetooth. The U2F NFC transport specification enables the creation of portable U2F devices such as credit cards and keyfobs that are simply tapped against the target device to authenticate to an online service. Alternately, a mobile phone with NFC capability can be programmed to act as an NFC U2F device. The user taps the mobile phone onto a target device to authenticate. Precise Biometrics partnered with Fingerprint Cards to have Precise BioMatch Mobile integrated into two new smartphones from Chinese manufacturers. The integrations will generate license revenues starting from the third quarter 2015. The value of license revenue is based on the number of sensors FPC delivers. Precise BioMatch Mobile provides integration of fingerprint matching functionality for smartphones and tablets, and is designed for small touch sensors in mobile environments.